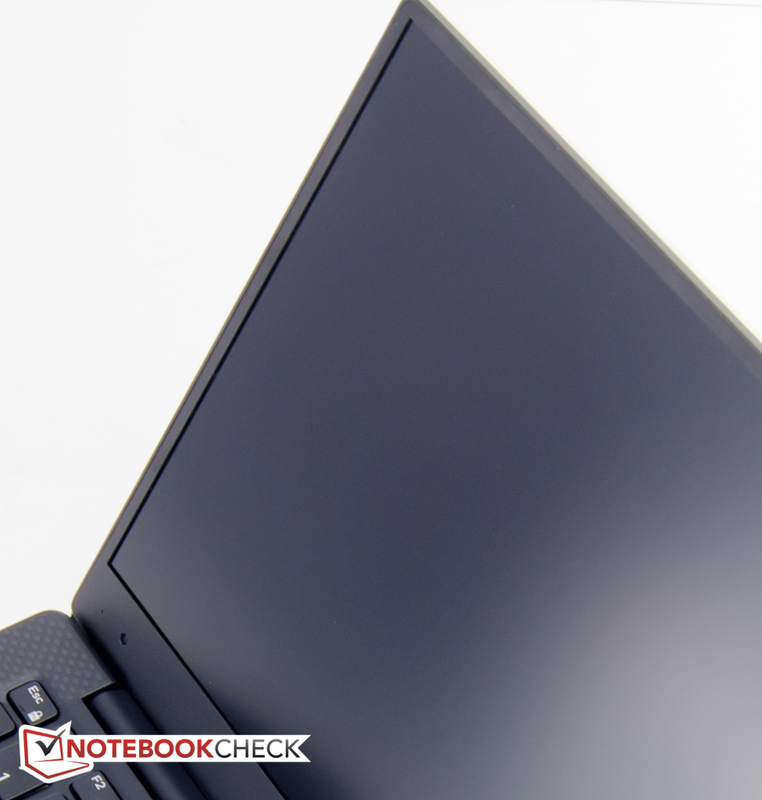 Not two months ago, we reviewed the Dell XPS 13-9343 Touchscreen Ultrabook, which comes - at least in our opinion - very close to what the ideal Ultrabook should look like. 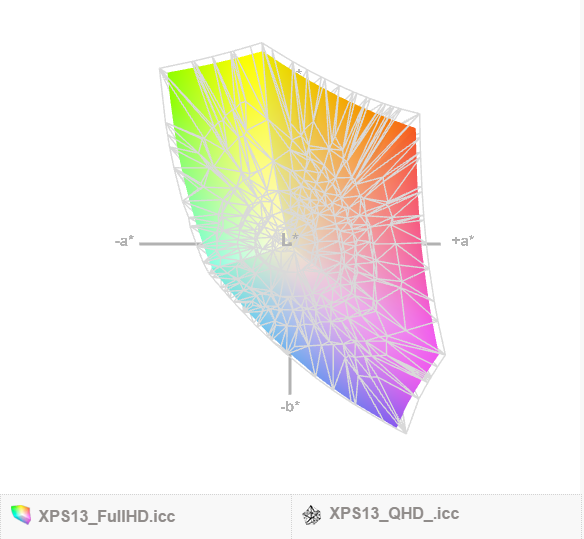 Its build quality is impeccable, the performance more than adequate, and the bright touchscreen features a novel near borderless design, which in turn makes the XPS 13 the smallest 13.3-inch offering to date (see below for a comparison of footprints). Not everybody needs the super-high QHD+ resolution and the touchscreen this model features - in particular in light of the rather hefty $1300 starting point. 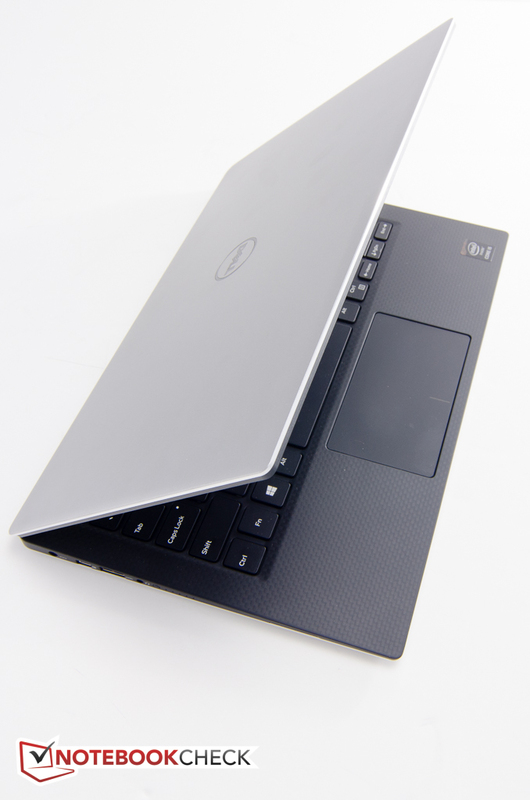 Enter the Dell XPS 13-9343 Non-Touch, which sells for only $900 when equipped with the same i5-processor, identically-sized SSD, but 4 GB instead of 8 GB of RAM. 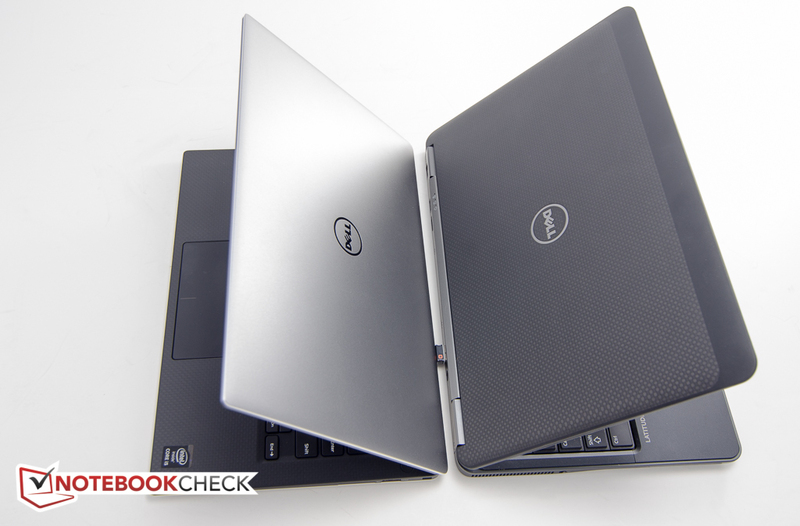 At the time of writing, Dell offers three different non-touch models, starting with an Core i3-equipped version with 4 GB of RAM offered at $800 and ending with a Core i5-model with 8 GB of RAM selling for $1000. 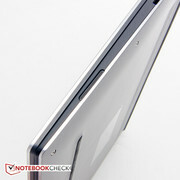 Only the touchscreen version is offered with a faster Core i7 CPU and a more substantial 256 GB SSD standard, however. Since the chassis and therefore the port selection, the keyboard and the touchpad, as well as the accessories are identical to the version we've already evaluated, we've omitted these sections. 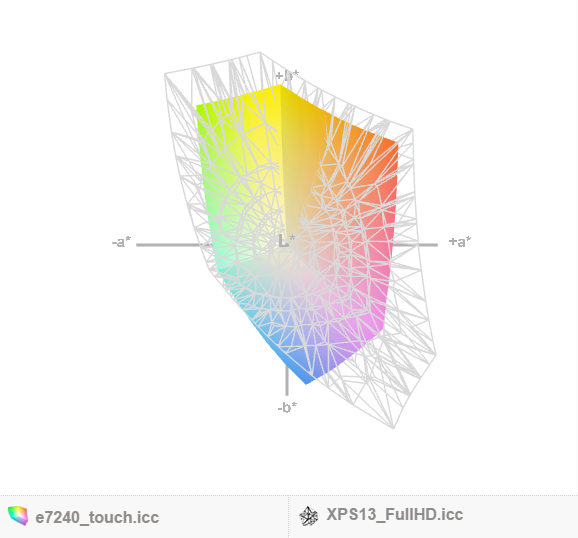 At 1184 g, the non-touch XPS 13 is about 7 % lighter than the touchscreen sibling, which tipped the scales at 1276 g. For detailed info on the design, measurements and other pertinent data, please check our previous review here. The big news, of course, is the new display offering and the subsequently much lower starting price of the versions equipped with it. Dell opted to use a matte IPS non-touch panel courtesy of Sharp (model SHP1420) with a resolution of 1920 x 1080 pixels. 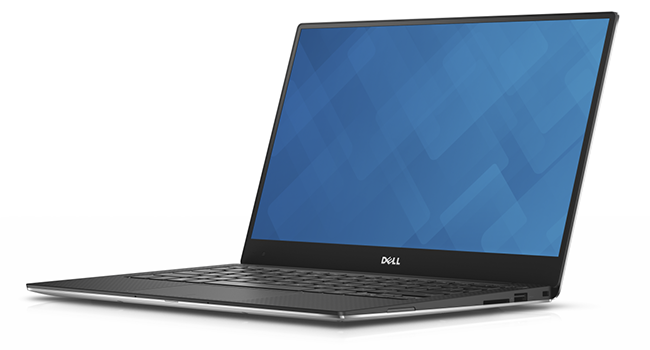 Just like the previously reviewed version, the new model features an ultra-thin 5mm bezel, which Dell calls "Infinity Display". A potential drawback of the design is the fact that the webcam is located on the lower left bottom edge, which tends to display the face of the user at a not-so-ideal upward angle to video-chat partners. Just looking at the price difference, one might assume that the new display is of much lesser quality, but fortunately, that's not the case at all. The new display is anything but low-end and looks, in our opinion, quite stunning. 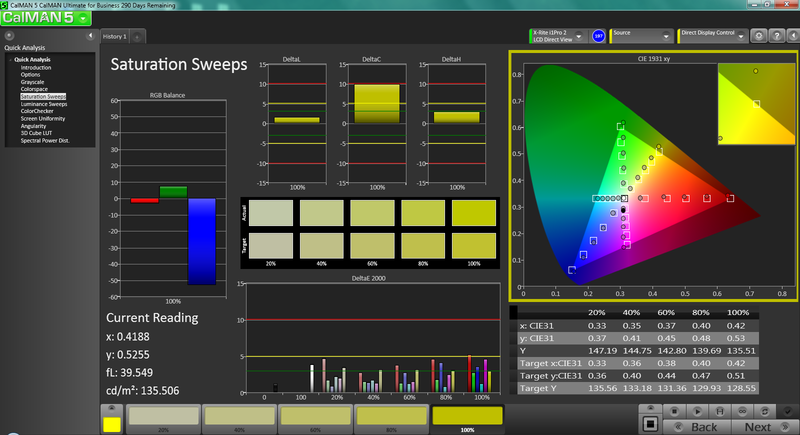 Our measurements reveal that the new screen is not only brighter at 405 nits compared to the touch version at around 370 nits, but the brightness distribution of 93 % is much better as well. The panel looks completely uniform to the naked eye, although there is some very minor display bleed at the upper edge. We are being nitpicky here, since this display bleed doesn't even extend a millimeter or so downwards from the bezel and extends the entire width, so it's really only noticeable when looking at a completely black background with the screen brightness turned all the way up. 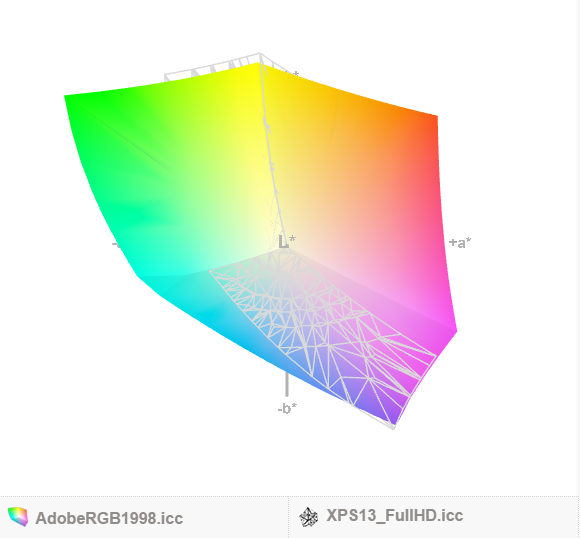 Speaking of black: thanks to a fairly low black value of 0.366 cd/m², the contrast ratio is also quite good - although short of great - at 1119:1. The touch version managed over 2000:1, which leads to even darker blacks. 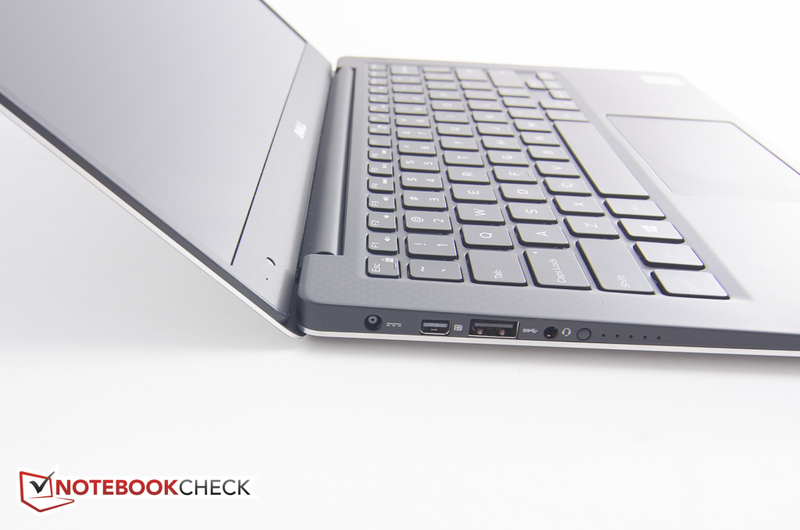 Still, the XPS 13 Non-Touch holds its own against competitors like the Yoga 3 Pro, which only managed to reach 360:1. Watching movies is definitely a pleasurable experience. 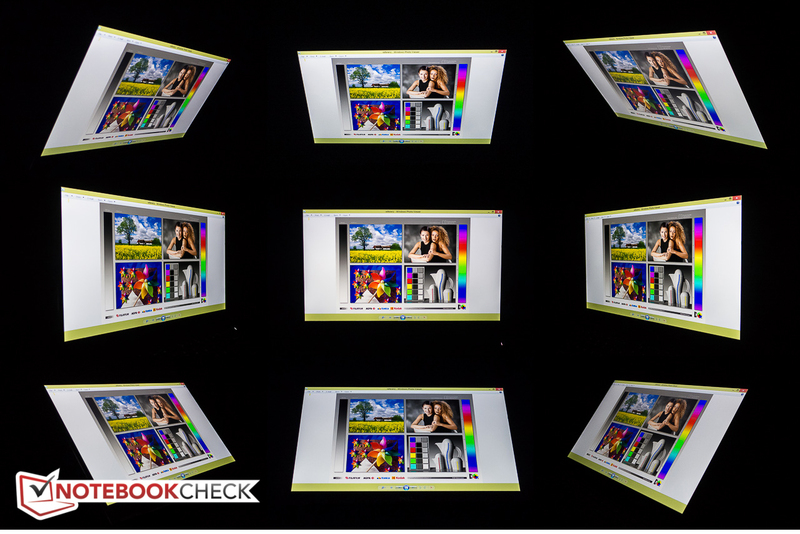 With sRGB and AdobeRGB98 coverages of 81 % and 60 %, respectively, the display panel is not really suitable for serious photography work. The business-oriented 12.5-inch Dell Latitude E7240 Touch fares much worse however and only covers about 43 % of AdobeRGB. 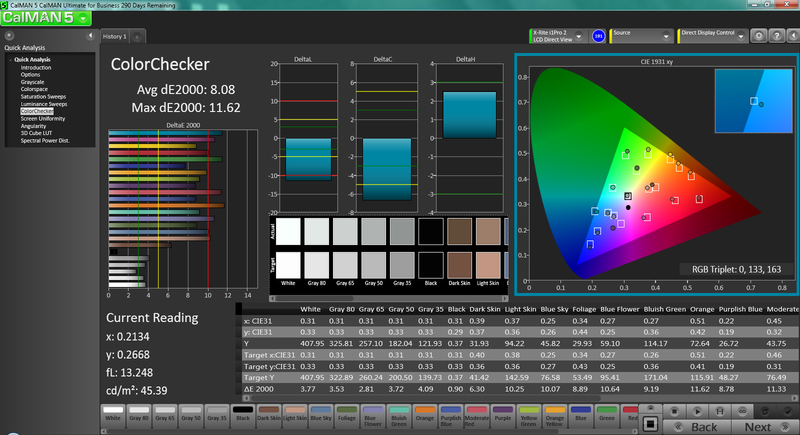 To get an idea how accurate the new panel is in terms of color reproduction, we use the CalMAN 5 software and a colorimeter. At an average DeltaE of 4.7, the panel handles Grayscale quite well, but color is a different story, as the DeltaE average here is closer to 8 - the highest in our direct display comparison above. Still, despite that, none of the colors are actually way out of the norm so the overall picture still appears to be well-balanced with no noticeable color cast. It also helps here that the display is of the non-glare variety, so colors don't appear nearly as overly saturated as in some cases. For every day use and given the price point, the panel will definitely suffice and should make most users happy. Outdoor usability is quite good and clearly superior to notebooks equipped with glare-type panels. Thanks to the high maximum brightness and matte display surface, even sunlight is not as much of a problem problem as it normally is - at least provided the user adjusts the display accordingly. Indoor use is generally possible without any caveats whatsoever. 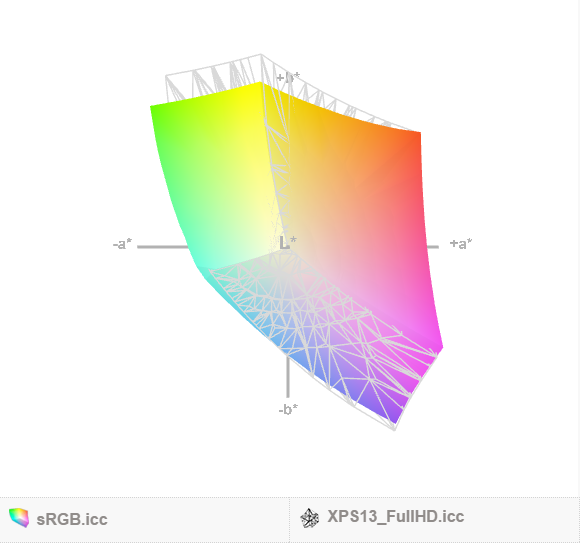 Viewing angle stability is also superb. Since the display does not have a glass panel on top like the touchscreen version, even very shallow angles are possible without any internal reflections underneath the glass layer and the display content remains always readable. 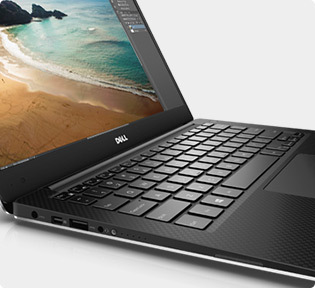 As we mentioned in our intro, Dell offers the XPS 13 with three different CPUs. The least expensive non-touch option comes with the Intel Core i3-5010U, a 128 GB SSD and 4 GB of RAM and retails for $800; the models with Core i5-5200U retail for $900 (4 GB, 128 GB SSD) and $1000 (8GB, 128 GB SSD), respectively. The latter model can also be upgraded with a 256 GB SSD for $100 more. The QHD+ touchscreen versions ship either with the Core i5-5200U (8 GB, 128 GB SSD) for $1300 or Core i7-5500 (8GB, 256 GB SSD) for $1600. An upgrade to 512 GB for the i7 version costs a fairly steep $300. 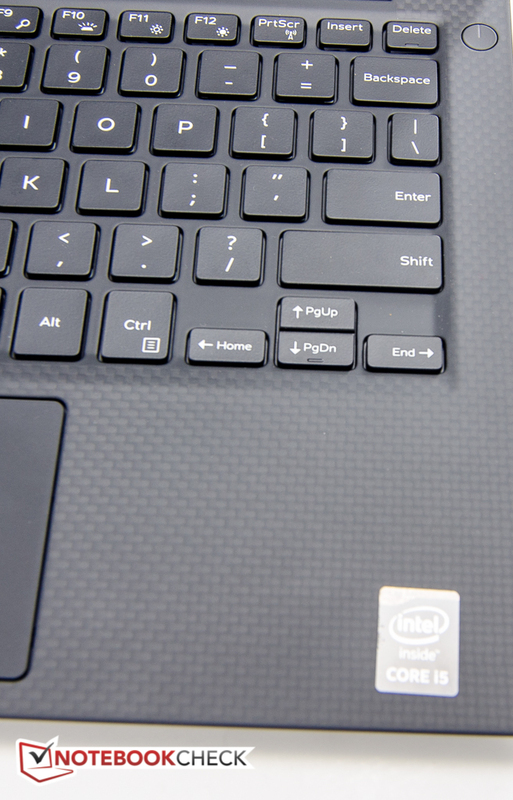 Just like the touchscreen variant before it, our non-touch review notebook comes with the Intel Core i5-5200U CPU, but only 4 GB of RAM instead of 8 GB. The DDR3L-RS RAM is soldered onto the motherboard and runs in dual-channel mode according to the tool HWiNFO64. The Ultrabook is a pleasure to use: the boot sequence happens in a mere 7 seconds and most of the time, programs launch instantaneously. The Intel Core i5-5200U is a Broadwell-generation ULV CPU rated at a nominal frequency of 2.2 GHz, although the built-in Turbo can overclock a single core to 2.7 GHz and both cores to 2.5 GHz. The Cinebench R11.5 scores of 2.85 (multi) and 1.28 (single) are marginally faster than the recently tested Lenovo Yoga 3 14 with the same CPU; interestingly enough, the touch-version of our review Ultrabook, which is also equipped with the same CPU, only managed 2.33 and 0.98 points - roughly 20 % lower. The other Cinebench versions (R10, R15) also confirm the results of the R11.5 test. Various other synthetic CPU benchmark scores- for example SuperPi and wPrime - also show a slight advantage for the review notebook, although the difference is not as significant here. At this point, we have no explanation to the cause of this, since both Ultrabooks behave almost identical during the CPU and GPU stress tests. 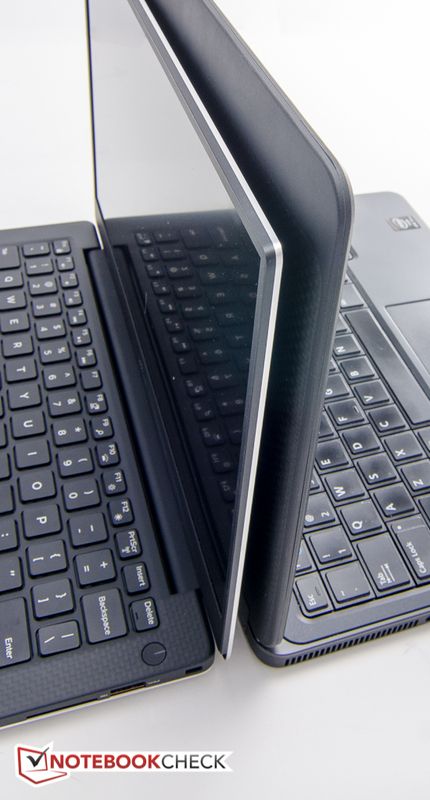 In order to compare the system performance, we run the synthetic PCMark benchmark tests. 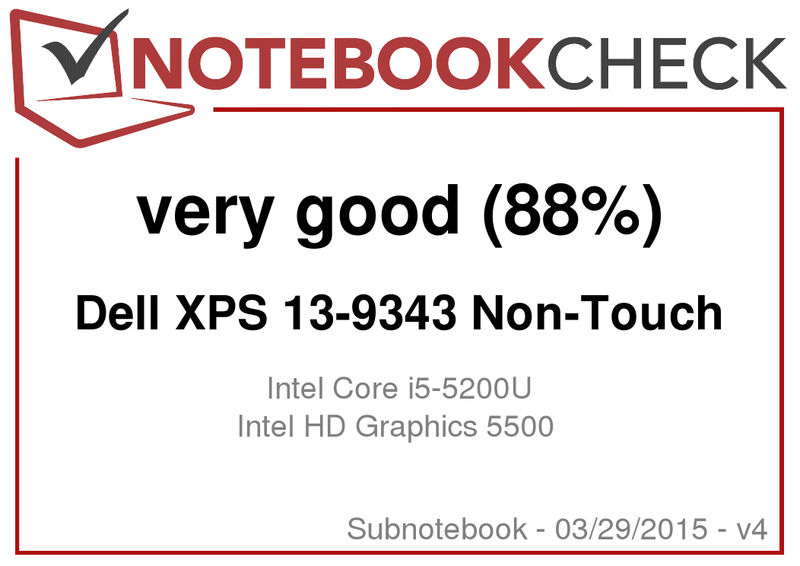 The Dell XPS 13 Non-Touch received 4745 points for the PCMark 7 test, which is slightly ahead of the Yoga 3 14 with 4659 points, but this time around trails the touchscreen-sibling (4934; + 4 %). The reason is likely the SSD performance, which is of particular importance for a good result. 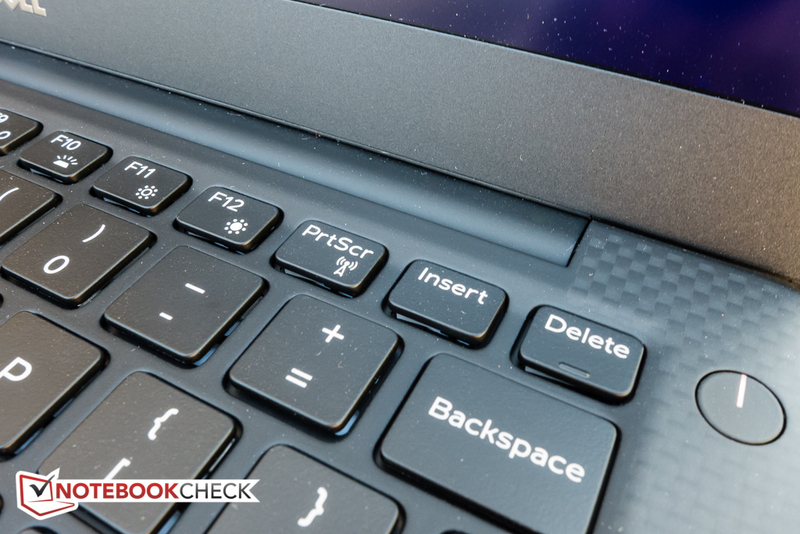 A look at the PCMark 8 scores does indeed show a performance advantage for the touch-enabled version (review Ultrabook 4803 points;touchscreen version 4936). 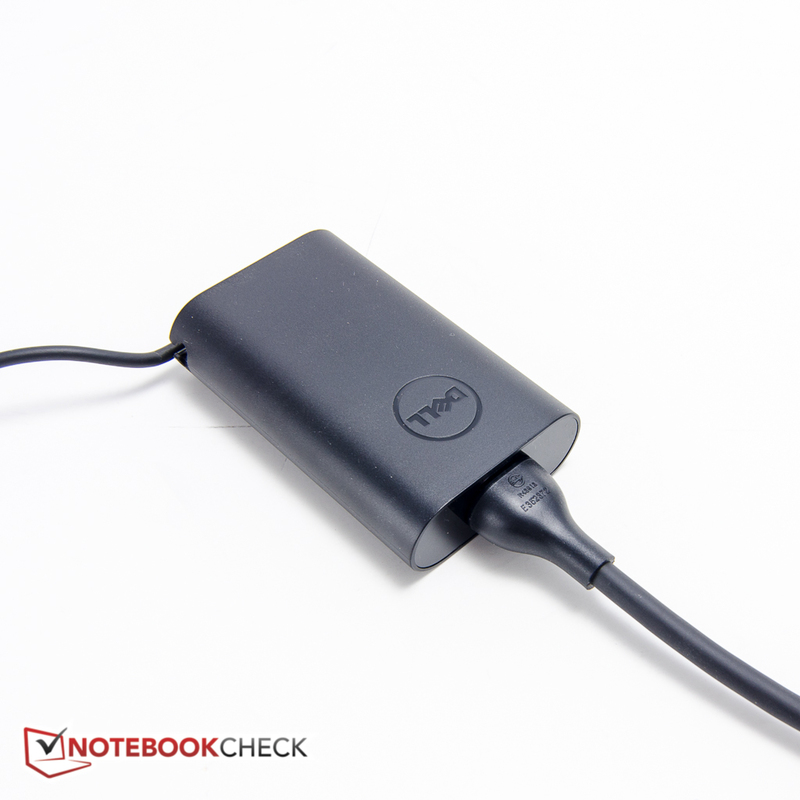 The XPS 13 Non-Touch review unit comes with a 128 GB Samsung PM851 M.2 SSD. Due to the way solid-state drives work, lower capacities generally don't perform quite as well as their higher-capacity brothers. In this case, the tool AS SSD clearly shows very high read, but slower write speeds of 498 MB/s and 120 MB/s, respectively. The XPS 13 Touchscreen-sibling comes with its 256 GB LiteOn SSD and shows sequential read and write speeds of 485 MB/s and 417 MB/s. 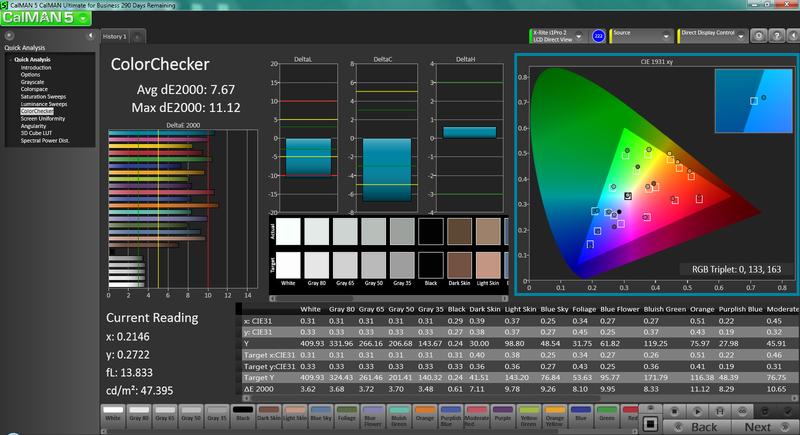 CrystalDiskMark also shows the same discrepancy in read and write performance. We have to point out that while there is certainly a measurable difference, the difference is not going to be noticeable during normal use. The lack of storage capacity of might pose more of a problem, since SSDs act adversely when the available free space drops significantly. Prospective buyers should evaluate their needs beforehand and decide if a model with a larger SSD isn't a better option. The mid-range integrated HD Graphics 5500 GPU is clocked at 300 - 900 MHz and offers a modest performance gain in the neighborhood of 10 - 20 % over previous integrated solutions (Haswell HD Graphics 4400 and HD Graphics 5000). Gaming is certainly not a strong point of the XPS 13, but of course the integrated GPU was delivered to deliver a good balance between graphics performance and battery consumption. Consequently, only older and less demanding titles are playable at all and resource-intensive titles are out of the question even at the lowest graphics settings and the lowest resolution. Good news: tests with 3DMark 11 with the notebook plugged in and then running on battery power revealed a statistically insignificant difference in performance. 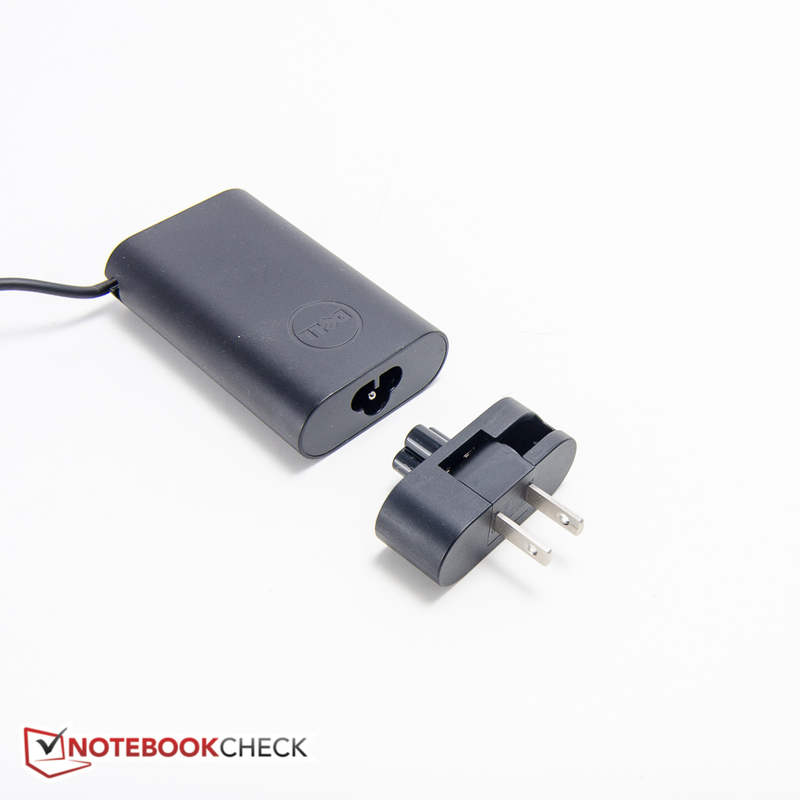 Full power is thus available even when away from any outlets. Particularly during idle, the XPS 13 is more or less inaudible with a maximum of just under 30 dB. 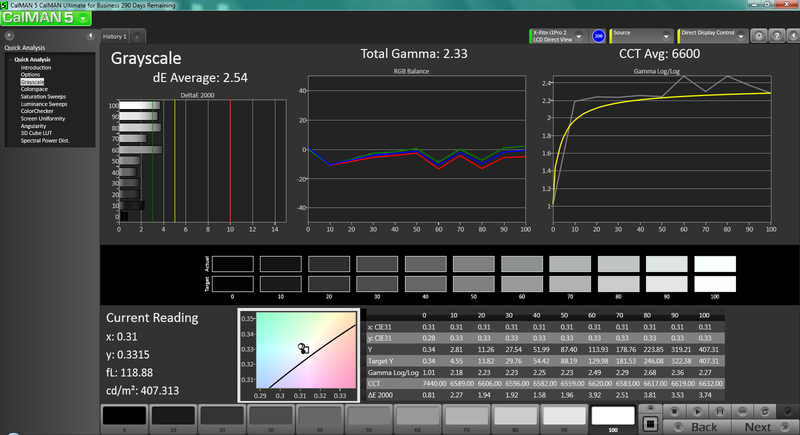 Even when pushed to the limit, the machine remains comparatively quiet at only 38 dB. 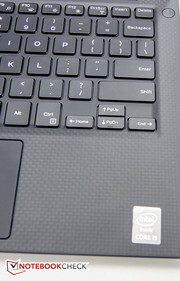 Dell must have updated the fan-control software, as the touchscreen version reached a much higher 48 dB. 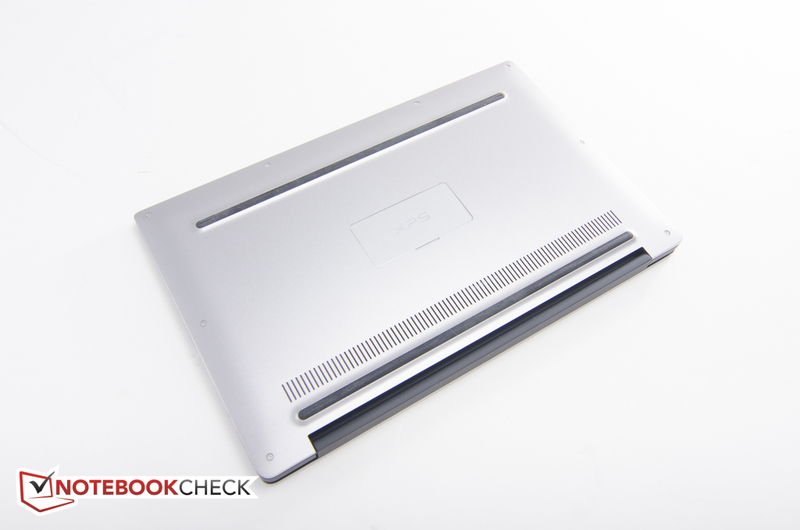 The 12.5-inch Dell Latitude E7240, which also features a very small chassis, also got much louder at 48 dB. Even when the fan is operating at its highest setting, the emitted sound is not plagued by any high frequencies so it doesn't become overly bothersome. During the CPU-part of our stress test (see two sections below), the fan was so quiet we had to put our ear next to the exhaust in order to hear it. 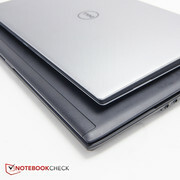 Overall, Dell has done a good job in keeping the Ultrabook quiet. While our review Ultrabook doesn't get as loud as the touchscreen version of the XPS 13, the observed temperatures show the reason why: during maximum load levels, the XPS 13 Non-Touch reaches about 45 degrees on the bottom middle towards the rear; the sibling tops out at 41 degrees in the same spot. 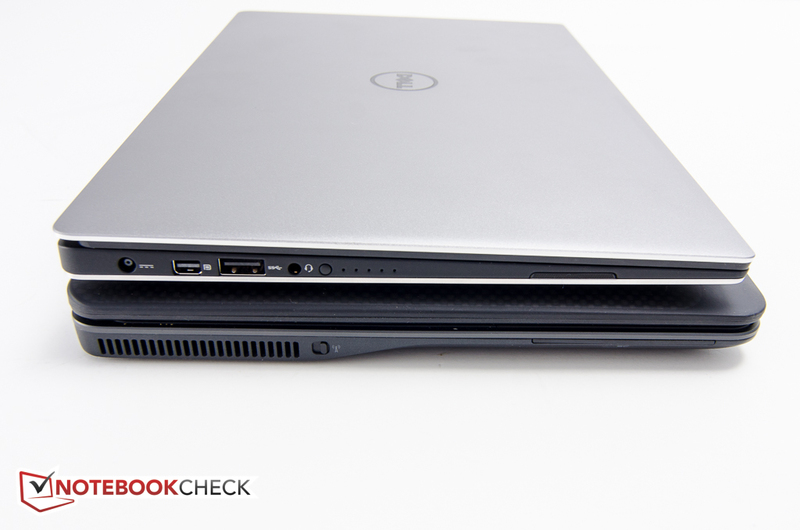 During idle, the two XPS models behave very similar, although the review Ultrabook runs just a smidgen cooler. Even at maximum and prolonged load levels, we never had issues using the XPS 13 on our lap, since the left and the right side of the notebook remain cooler than the middle. (±) The average temperature for the upper side under maximal load is 33.8 °C / 93 F, compared to the average of 30.7 °C / 87 F for the devices in the class Subnotebook. We use our stress test to identify potential throttling issues and to check if a review notebook remains stable even during adverse conditions. During the CPU stress portion with Prime95 running, the clock rate for both cores remained at the maximum Turbo-frequency of 2.5 GHz with temperatures stabilizing at 80 - 81 degrees C after an initial jump to 83 degrees C. During the GPU test with FurMark, the GPU started at the maximum of 900 MHz, but as the temperature surpassed 80 degrees briefly, the frequency dropped to between 750 and 800 MHz. The temperature stabilized again right around 80 degrees C.
With both Prime95 and FurMark running for more than an hour, we observed a temperature increase to about 80 degrees, which resulted in an immediate drop of the CPU clock rates to between 1.4 - 1.5 GHz and GPU speeds of 750 to 850 MHz. Even after several hours, the frequencies and temperatures hadn't changed at all. A test with PCMark 11 immediately after the stress test showed no decrease in performance due to heat related issues. The XPS 13 Non-Touch thus handled the stress test in a manner very similar to the touchscreen version and temperatures generally did not exceed 80 degrees C for more than just very brief moments. Fur such a slim Ultrabook, the Dell XPS 13 features a very large battery with a capacity of 52 Wh. The touch-enabled version impressed us with very respectable run times and we were hoping to see even better battery life with the non-touch version. On their web page, Dell does promise "..up to 15 hours of run time on the FHD display (and 11 hours on the QHD+)...". 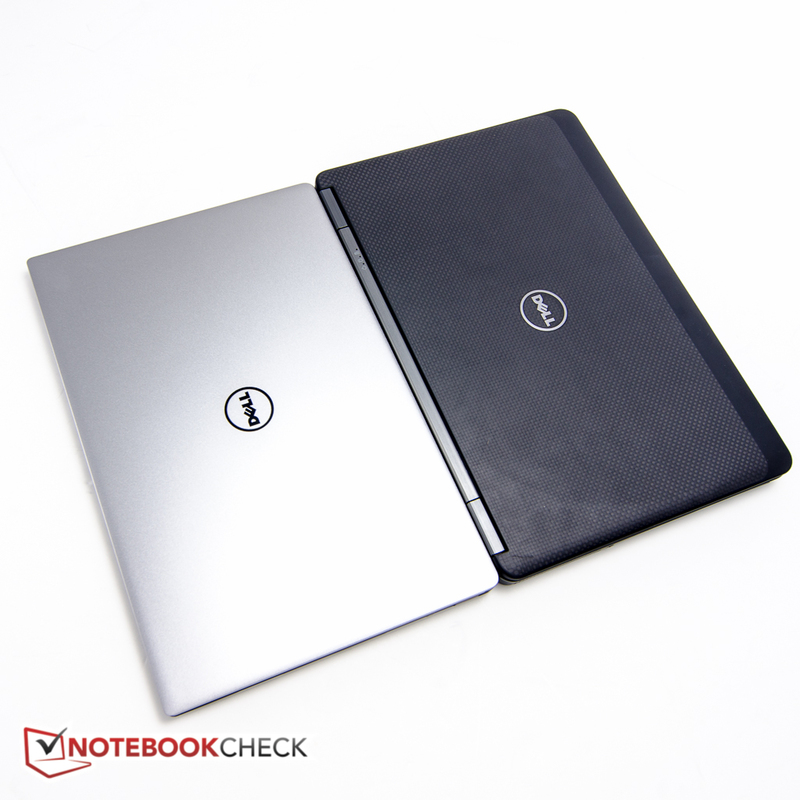 With a run time of 2 hours and 25 minutes during the Battery Eater Classic Test (High Performance profile enabled, wireless modules on, maximum brightness), the XPS 13 Non-Touch only outlasted the touch-enabled sibling by roughly 5 minutes. Similarly, during the WiFi test (balanced profile, wireless on, screen brightness of approximately 150 nits), the Ultrabook lasted for 10 hours before we had to plug it back in. The touchscreen version lasted for 9 hours and 40 minutes - although in that particular case, the power saver profile was used, which probably makes the tests not quite comparable. Needless to say, the results are still very compelling, especially considering that competitors like the Yoga 3 Pro only lasted for 6 hours and 20 minutes during this test. 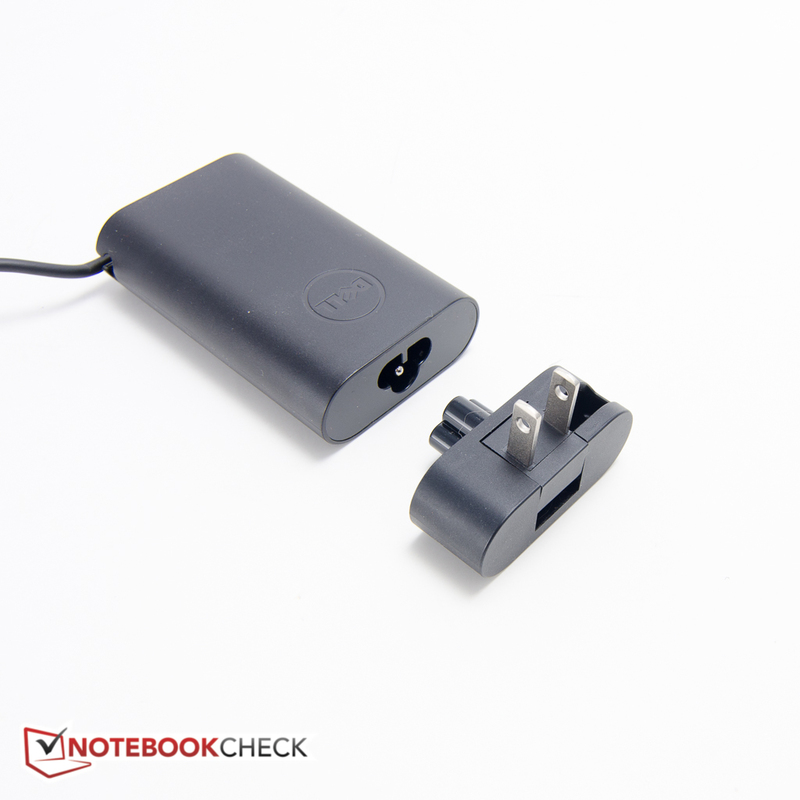 Most users should be able to get through an entire workday without having to recharge their notebook. During the not overly useful Battery Eater Reader's test (power saver profile, wireless off, screen brightness turned down all the way), the Ultrabook lasted a very good 21 hours and 35 minutes before shutting down. 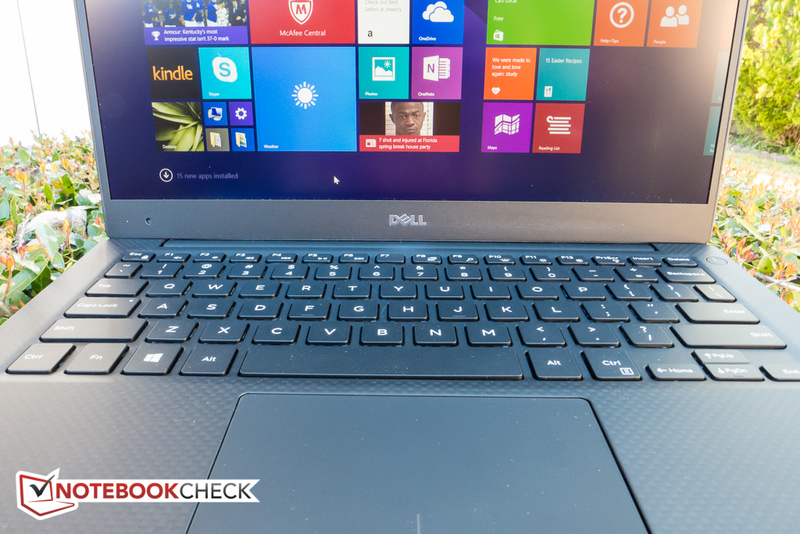 The QHD+ touch-equipped version of the XPS 13 impressed us with our editor noting that "...Dell’s latest Ultrabook pulls out all the stops with smart revisions to an already widely-praised design...". The newest member of the Ultrabook, this time sans touchscreen and with a lower mainstream resolution of 1920 x 1080 pixels, continues where the more expensive sibling left off. There's a lot to like: the new screen is not only brighter, but it's also non-glare, which brings significant advantages for those who need or want to venture outside a lot. The build quality is superb as before and the battery life outstanding at around 10 hours of normal use, which is long enough to get most users through a work day with ease. The keyboard might not quite reach the standards set by the Latitude series, but it still works well and offers a backlight to boot. The perceived performance is great and we've hardly every found ourselves wishing for the i7-equipped version. Even the entry-level XPS 13 with i3-processor, which sells for $800, should offer satisfying performance - but unfortunately, the only SSD offered is the one with 128 GB. Savvy users can of course upgrade the M.2 drive to a larger model. 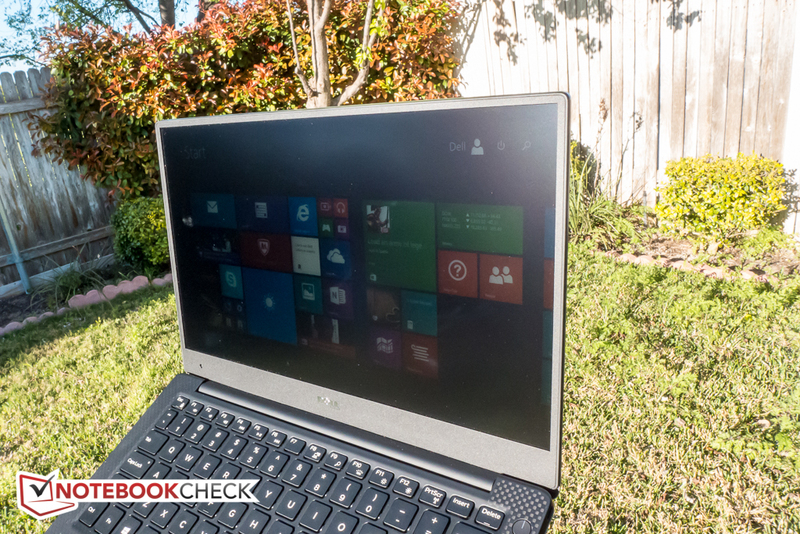 Users looking for a competent Ultrabook can't go wrong with one of the XPS 13 models. 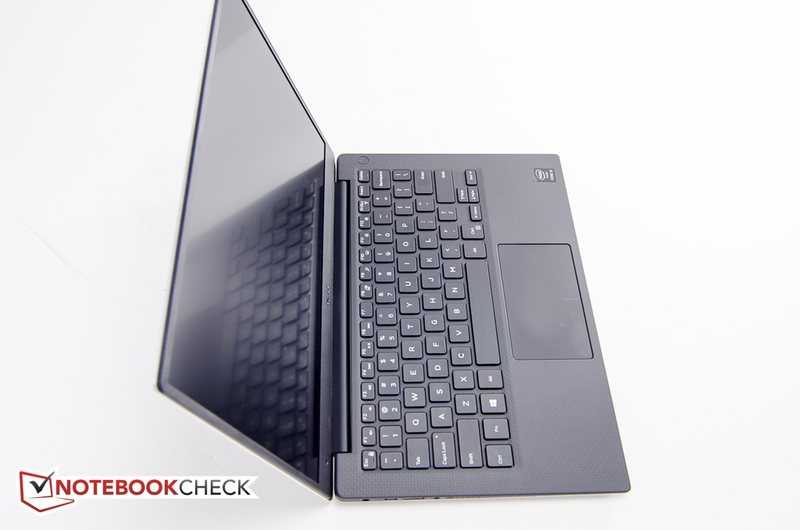 It might not induce quite as many superlatives as the Yoga 3 Pro, but it's just a more practical package all around. ...as well as from below. The air intake - the hot air exits between the base unit and the display panel. A magnetic flap hides the Service Tag number and other pertinent info. The speakers are installed along the side and offers surprisingly good sound given the size of the Ultrabook. The XPS 13 sitting on top of the 12.5-inch Dell Latitude 7240. The XPS 13 is actually a bit smaller, despite the larger display. The Asus is significantly bigger and heavier. ...to allow for maximum flexibility.